Most girls grow out of the crazy horse phase as soon as they discover boys, but my friend Rachel—who is 28 years old—was intent on getting me to attend Royal Ascot with her this year. I agreed, even though I knew little about it: I assumed it was an English horse race and that we’d get to drink gin outside. It was only after an elaborate effort to secure tickets (or badges) to the restricted Royal Enclosure section—a process that, for Americans, involves writing to the US ambassador to the UK and sending in character references by mail—that I began to wonder what I had gotten myself into. Suddenly it began to feel less like we were going to a horse race and more like we were going to Prince Charming’s ball. In contrast, the Kentucky Derbymerely states that tennis shoes, jeans, shorts or athletic apparel are not allowed. Hats for ladies are recommended, and men can wear khakis. 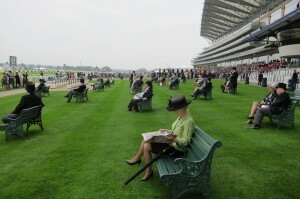 Next to Ascot, the Derby looks like a picnic at a high school softball game. I’ve never witnessed this world before, and for good reason: it’s really hard to get inside of it. My English husband is aghast that I am allowed here because even hecan’t gain entrance into the Royal Enclosure area: all English guests must be sponsored by an existing member who has attended the annual event at least four times. Even babies and young children aren’t allowed here (minors aged 10-16 are admitted on Friday and Saturday only). No, says a woman in the department store, firmly. Hats must remain on at all times. “I know women who have been turned away at the Royal Enclosure,” she informs us. Who would actually turn women away? The fashion police, obviously. Officially known as Dress Code Assistants, they wear shiny silver dresses and rule with an iron fist—if your hat isn’t suitable, they will give you another or offer to sell you one. If your dress has spaghetti straps, they will forcibly drape pashminas over your shoulders. A few days later, we took an hour-long train to Ascot, a town 25 miles west of London. We walked in a crowded procession—a sauntering sea of colorful hats—until we reached the entrance to the grounds. The fashion police were guarding the entrance. One policewoman tapped a lady on the shoulder who was holding her hat in her hand. “Madam,” she said, and pointed to her head. “Your hat.” Another measured the base of woman’s fascinator (one of those headbandy-feathery things that make women look like birds) to ensure that it was at least four inches in diameter (a size that would render it, I kid you not, a “hatinator”). Men and women who arrive unprepared were offered outfit fixes for purchase. The assistants were half fashion police, half that mean saleslady in Pretty Woman. We wander around until 2 p.m., when everyone gathers around the racecourse fence and waits for Queen Elizabeth II &Co to go around the track in horse-drawn carriages. The band was playing an instrumental version of Adele’s “Skyfall.” Earlier, the posh crowd had been buzzing away in their own conversations, but when the Queen finally rounds the corner near the finish line, the men remove their top hats, and a hush falls over the grounds. We lose about £20 (or $31) on the first race, so Rachel and I give up and leave the lawn to wander into the Royal Enclosure garden. We pass Rosé Bar, where everything—the champagne, the wine, the cupcakes, and the macaroons—is pink. We also pass a restaurant serving lobster, crab and caviar. Last year, 4,500 pounds of fresh lobster, 35,000 asparagus spears and 30,000 chocolate éclairswere consumed during the week. Did we stumble into Downton Abbey? Still, the next day when I’m on the bus and the girl in front of me begins flossing her teeth, I find it almost reassuring to know Royal Ascot week will always be one moment of Old England frozen in time, where everyone is impeccably groomed and gracious as they wave to the Royals and sip their cocktails. They have one perfect week to live out their posh, privileged glory—and we have plenty of occasions for the nightclub. Previously published in The Hairpin.